When Julianna Carlson left her parents’ Delridge home for college in Santa Barbara, she never expected to tire of the eternal California sunshine. But the longtime Pacific Northwesterner couldn’t stay away—she graduated in 2015 and returned. She’s now settled on a plot of land she purchased just down the street from the house she grew up in. Although the neighborhood is familiar, her home is completely novel. 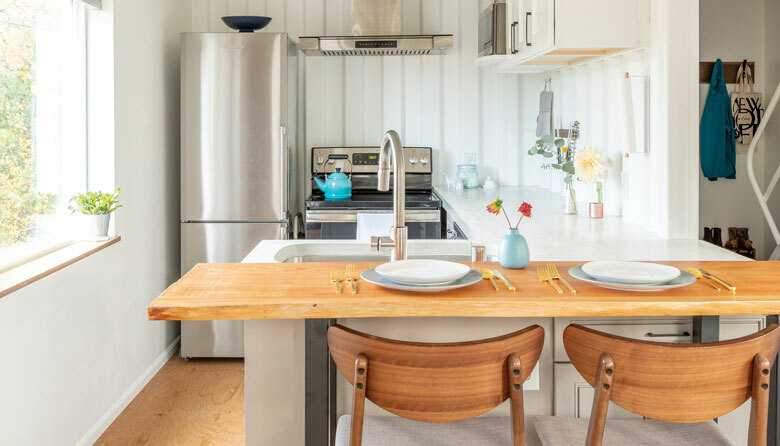 Disappointed by homes available in her price range, Carlson decided to do something different: The political science major, with no architectural experience, sketched out her own home made from used shipping containers. Carlson purchased six 20-foot shipping containers from DryBox, a Chehalis company that provides shipping containers with custom modifications. The containers were trucked in and stacked in two days during the spring of 2017. Window holes were pre-cut based on Carlson’s specs, but the interior build-out—drywall for exterior-facing walls, plumbing, installing electrical—took almost a year, largely because obtaining proper permits wasn’t an easy process, she says. The city didn’t really know how to handle a container home. On their exteriors, Carlson intentionally left the shipping containers—four on bottom, two stacked on top—largely untouched. But inside, she went with a cozy nautical theme: The handrail to the master bedroom upstairs is reminiscent of those on a ferry; tiny painted cargo boats are stenciled onto an accent wall downstairs; and a porthole in the master bedroom’s walk-in closet gives the feeling of being in a ship’s hull. “I really wanted the interior space to feel bigger than it was,” Carlson says of maximizing her 1,000 square feet. “We’re a boat family—my parents used to commercial fish. I firmly believe that boats have it figured out when it comes to putting as much as possible in a small space.” To do that in her home, she relies largely on portable furniture—like a wheeled slab coffee table she made—that can be pushed aside when she and boyfriend Kris Wilson are entertaining. There’s also a 1,000-square-foot outdoor patio, which doubles the livable space (as weather allows). Now 25, Carlson likely won’t live here forever. But she says she’s designed her home in a way that will allow for another container to be added to provide more space later. After all, she figures she only spent 70 percent of what it would have cost her to buy a comparable existing home. “I’ve really fallen in love with shipping containers, more than I ever thought possible,” she says.